The sculptor Anthony Padgett attended a WPAG Reception at the Chairman’s home on Friday evening 29th June 2018, attended by invited members of the WPAG Committee, Welwyn Parish Council, and other local organisations and dignitaries who had shown a close interest and support for the project to install the Van Gogh Statue in the village. 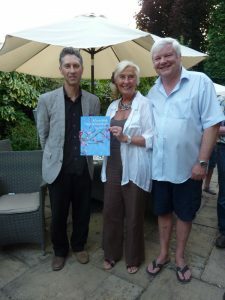 He was welcomed by Carl Storer, WPAG Chairman, who proudly explained the vital role played by the WPAG which had led to the successful formal acceptance by the Welwyn Parish Council..
Anthony acknowledged the involvement of the WPAG Project Manager, Sandra Kyriakides in making this happen and, as a show of his thanks, he presented her with a signed copy of his book ‘A Year with Vincent Van Gogh‘. 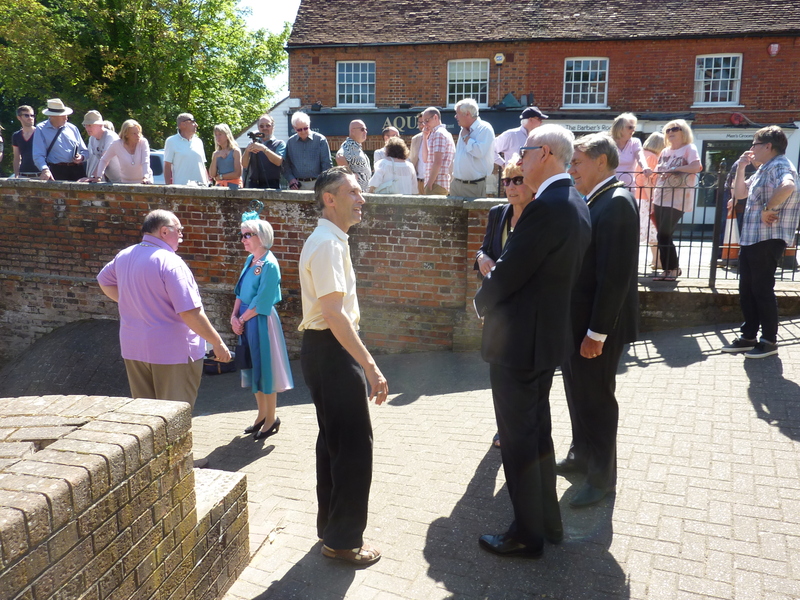 On Saturday morning, 30th June 2018, Mrs Marion Brown MBE JP, Deputy Lord Lieutenant of Hertfordshire joined a gathering of villagers and local Borough and Parish Councillors to officially unveil the Van Gogh sculpture outside Welwyn’s Bridge Cottage Surgery in the High Street. 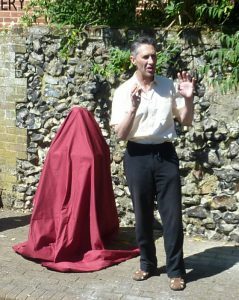 She was accorded a formal welcome by Councillor Bill Morris, Chairman of Welwyn Parish Council. 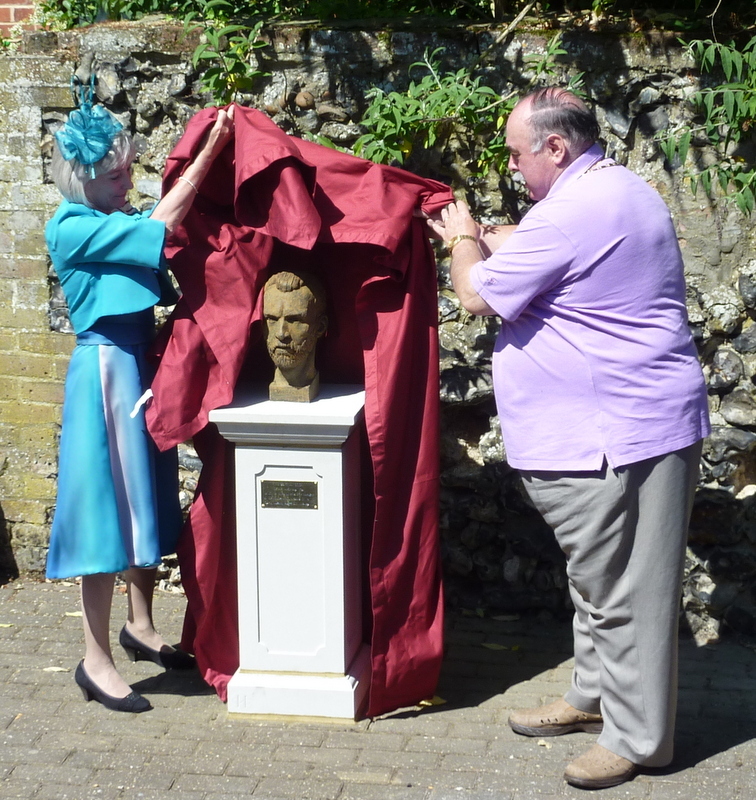 On behalf of Welwyn residents, Cllr Morris acknowledged the great good fortune offered to the village by Anthony Padgett’s most generous donation of the Van Gogh sculpture, which is in fact the first of his busts to be displayed in England. Anthony reminded us that Vincent Van Gogh had walked 100 miles to visit his sister, Anna, who was a teacher at Miss Applegarth’s School in Forge Lane, and pondered the thought that Vincent might have bathed his tired feet in the Mimram at the very spot where we have now erected his statue. The Offer – almost rejected. Vincent Van Gogh’s sister Anna lived and worked in Welwyn, (Miss Applegarth’s School in Forge Lane) and her brother walked a 100-mile journey to visit her here in June 1876 and there are plaques in the village to commemorate that journey. 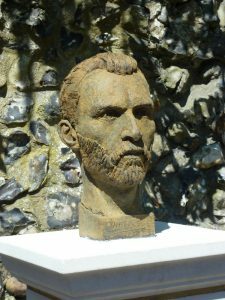 In February 2018 year, sculptor, artist and author, Anthony Padgett wrote to Welwyn Hatfield Borough Councillors, and other official organisations, generously offering a cold-cast bust of Vincent Van Gogh.to match similar offers made to other areas associated with Van Gogh’s life and travels in Belgium, France and England. 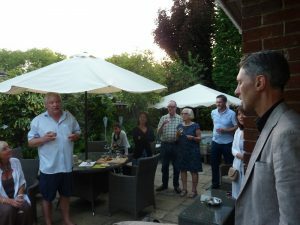 But the Welwyn Invitation almost went off the rails because Mr Padgett’s email to our local Councillors went without acknowledgement or reply! 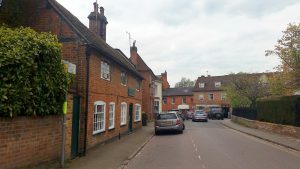 Thankfully the Chairman of the Welwyn Garden City Society, Will Davis, recognised that the historical connection was in fact with Welwyn village and, after contacting WPAG’s Project Manager Sandra Kyriakides and receiving an emphatic assurance of our interest, he immediately gave Anthony Padgett contact details for Sandra and the Welwyn Plannng & Amenity Group. During 2017, Mr Padgett studied the legacy of Van Gogh, then created a sculpture and 67 oil paintings to parallel and contrast Van Gogh’s life with his own. Without delay, Sandra contacted Anthony Padgett to confirm Welwyn’s interest and subsequently set up liaison between him and Welwyn Parish Council Chairman, Bill Morris. Welwyn is extremely fortunate to have such an appropriate sculpture to add to its many Heritage sites of public interest. The ceremony commences at 1030 am followed by a Reception at the Civic Centre hosted by the Welwyn Parish Council. 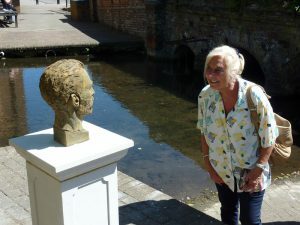 The ceremony for the unveiling of the Van Gogh sculpture by Mrs Marion Brown MBE JP Deputy Lord Lieutenant of Hertfordshire will take place on Saturday 30th June 2018. The ceremony will begin from at 10.30am at the ford area of the River Mimram in the High Street (in front of the Bridge Cottage Surgery opposite the High Street Car Park), where the Chairman of Welwyn Parish Council, Cllr Bill Morris, will say a few words, followed by the artist, Anthony Padgett. The official ceremony will take place at 11am when Mrs Marion Brown will officially unveil the sculpture. Following the ceremony, everyone is invited to move to the Civic Centre in Prospect Place for refreshments and an opportunity to view up close a copy of the sculpture. 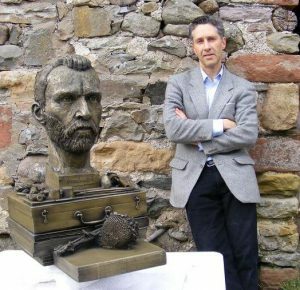 The sculpture has been donated by the artist Anthony Padgett who has made a number of cold-cast busts of Vincent Van Gogh which he has donated to areas associated with the artist life (including Belgium, France and England). In 1876 Van Gogh walked 100 miles from Ramsgate to Welwyn to visit his sister Anna who lived in the village. This is the third of a series highlighting Welwyn’s rich heritage of Listed Buildings. It is extracted from an old document found within WPAG archives which is represented as ‘the 29th list of buildings of Special Architectural or Historic Interest‘, (for Welwyn Parish within the District of Welwyn Hatfield), and ‘certified on 9th January 1989′ by the Executive County & Estates Officer of Hertfordshire County Council. N.B. This might not be the latest such list, and should not therefore be relied upon for its accuracy. There have been amendments, and this extract is provided solely for information and interest. House. C17 core, later C18 red brick casing. Vitrified brick headers, old tile roof. Mid C17 chimney stack towards W end with conjoined square shafts and ovolo cornice. 3 x 1st floor 3-light leaded casements with metal frames in pegged oak surrounds. Segmental-headed ground floor early C19 casement and fixed windows with glazing bars. 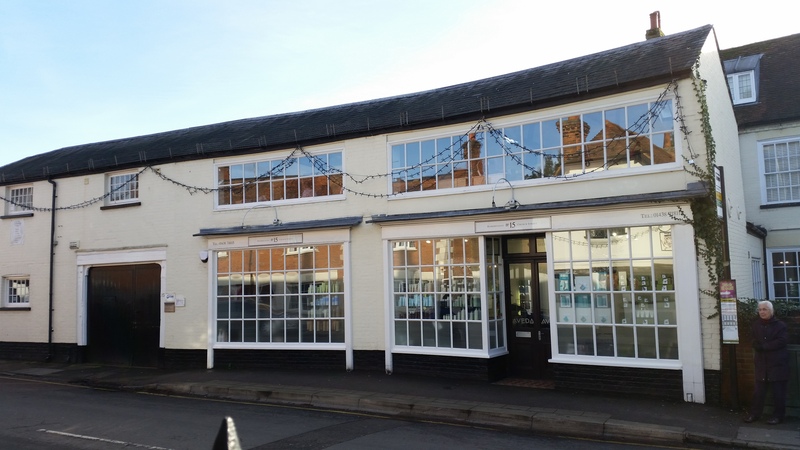 This is the second of a series highlighting Welwyn’s rich heritage of Listed Buildings. It is extracted from an old document found within WPAG archives which is represented as ‘the 29th list of buildings of Special Architectural or Historic Interest‘, (for Welwyn Parish within the District of Welwyn Hatfield), and ‘certified on 9th January 1989′ by the Executive County & Estates Officer of Hertfordshire County Council. House. 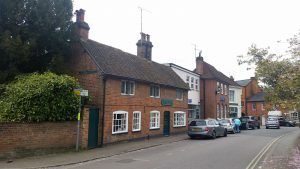 Early C19 front, probably to an earlier timber framed building. Roughcast. Old tile hipped roof. 2 storeys. 3 flush sash windows in architrave surrounds. Semi-circular porch with thin wooden columns on cement piers. Mutuled cornice and door with segmental fan. 1st floor French window. 1-window block set back on W with large chimney stack at join and 1st floor sash window. Street front with modern shop window. 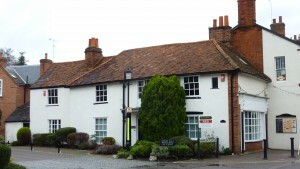 This article is the first of a series highlighting Welwyn’s rich heritage of Listed Buildings. It is extracted from an old document found within WPAG archives which is represented as ‘the 29th list of buildings of Special Architectural or Historic Interest‘, (for Welwyn Parish within the District of Welwyn Hatfield), and ‘certified on 9th January 1989′ by the Executive County & Estates Officer of Hertfordshire County Council. Early C19 warehouse and shop. 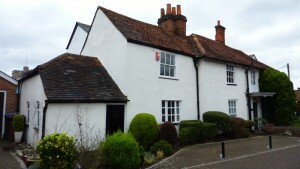 Painted red brick, low slate roof. Long Range. E side has 3 1st floor small pane ventilators and ground floor wood frame cart entrance with carved angle braces; W side has 2 shop fronts both with pilaster and paterae surrounds and fascia cornices. Left hand side is 36 panes, right hand side is double fronted with deep recess to door. Upper-floor window bands with similar glazing bars. 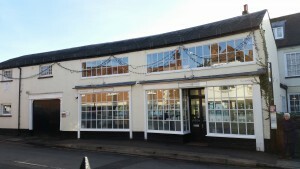 (The photo was taken on 1st December 2015 and shows the building in its current use as a Hair Dressing Salon, and decorated with Christmas Lighting). Pulhamite artificial stonework – further appreciation. 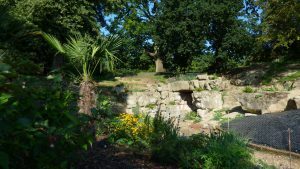 Our post about the volunteer efforts to uncover the artificial Pulhamite stone in the Danesbury Fernery has raised a great deal of fresh interest. If you want to extend your knowledge and understanding of the special attributes and heritage values of Pulhamite, then we have learned that there is a Presentation this coming Saturday 3rd October 2015 to celebrate The Great Restoration of the Swiss Garden at the Shuttleworth Collection, Old Warden, nr Biggleswade. This is an all-day Study Day to celebrate Pulhamite rockwork and its conservation, for which details, and the need for a fairly rapid online booking Form, can be found at the Shuttleworth Collection website.